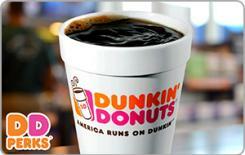 Dunkin' Donuts offers great tasting food and beverages that will keep you running throughout your busy day. Refuel with our legendary coffee, or start your day with a hearty, satisfying breakfast sandwich. There are now more ways to satisfy your appetite than ever before, made to order just the way you like. The reloadable Dunkin' Donuts Card is a convenient everyday way to pay for all your DD favorites and is accepted at any participating Dunkin' Donuts restaurant.